The vertebrae in your spinal column are separated by soft pads known as intervertebral discs. These discs serve as shock absorbers and allow your spine to be more flexible. They may move, or herniate, toward your spinal column for a variety of reasons. People often refer to a herniated disc as "slipped" or "ruptured". Diagnosis and treatment, both surgical and non-surgical, should be directed by your health care provider. The intervertebral disc is composed of two parts, an outer fibrous portion and an inner nucleus. Herniation occurs when the nucleus pushes through the outer fibrous portion of the disc towards your spinal cord. Herniation places pressure on the nerves in your spinal cord, causing pain, weakness or numbness in your arms, legs and back depending on the level of herniation. Sciatica, or sharp pain that reaches from your bottom to the back of your leg, is the most common symptom. 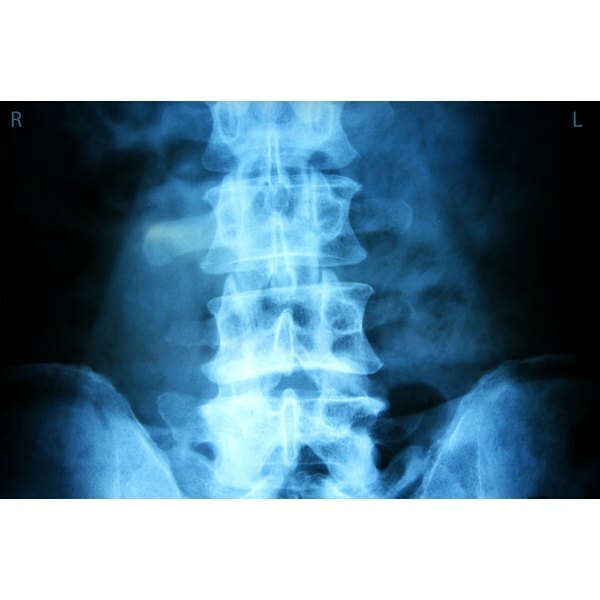 Health care providers diagnose herniated discs in the office by physical examination, medical history, x-ray or other imaging tests. Inversion therapy is a method of spinal traction, or decompression, that involves you being in a head-down position. The theory behind inversion therapy is to relieve the pressure at the nerve roots and discs in your spine by taking away the pressure created by gravity. This also opens up the intervertebral space, again, as a way to relieve pressure in your spine. Inversion tables are the method commonly used for inversion therapy, as they provide the most support to your body. Another method of inversion therapy includes using a stabilizing frame to hang from. Inversion therapy has been used to help relieve pain in those with herniated discs by allowing your spine to be truly non-weight bearing. Other benefits of inversion therapy may include helping to strengthen ligaments in your body, improve balance and spacial orientation as well as stimulating your circulatory and lymphatic systems. You may experience decrease in stress and an increase in energy from using an inversion table as well, although the reasons for this may simply be related to having a decrease in pain. If you have heart disease, high blood pressure, glaucoma or are pregnant, you should not use an inversion table, as they slow your heart rate and increase blood pressure. Inversion tables may be used within a treatment program for individuals with herniated discs, but typically are not the sole treatment modality. The safety of this device is not regulated by the Food and Drug Administration and its use should be discussed with your health care provider.